Any questions about Boqa? All answers to your questions are in our FAQ. Boqa is a French company located in Saint-Loubès (France), which designs and creates furnitures in its own workshop, meant to be Indoor and Outdoor. The furnitures are made of epoxy steel, polyvinyl, leather and hemp. How are your furnitures created ? First of all we choose the design of the furnitures, then we create them in our workshop. Once the steel structure is ready, we proceed to the braiding, handmade by ourselves. All of your furnitures are really 100 % made in France ? We bend steel bars and form ourselves all of our structures in the workshop of St Loubès. The polyvinyl yarn used to braid and rope our furniture is made in a French SME located in the Jura. For more information on the manufacturing process, we invite you to consult the page "the spirit Boqa" which details the different steps required to create our furniture. With more than 80% of the added value produced in France, we position ourselves as genuine ambassadors of Made In France and we do not just add a simple label affixed to our products or even a simple assembly. We make a point of valuing the local sectors and we are proud to realize this by highlighting the human values ? ?that accompany Boqa since its creation. What are the delivery deadlines ? As far as possible we deliver within 10 days. However, it can happen that during periods of high demand (April, May, June) we have a production delay. Consecutive size packages with sofas or more than two Acapulco armchairs are sent by carrier and not courier. There is therefore an added delivery time of 24 to 48 hours. If you want to offer an Acapulco armchair for a birthday of a particular color or if you have an Acapulco child chair to offer for a birth, you can call us or contact us by mail to confirm what is feasible via the contact page. Delivery charges are included in the sale price. The price of the Acapulco sofa is 699 €, the price of Zipolite table is 329 € or the price of the Acapulco armchair is 299 € for a delivery in FRANCE. A surcharge will be applied in different countries of Europe and you can ask for quotations for any delivery outside Europe. How do I clean and maintain my Boqa's furniture? BOQA's furnitures are very easy to maintain. The water resistant metal structure can be washed with a damp sponge. In case you leave your Acapulco chair outside all winter, you can put the water jet on the chair to clean it completely and let it dry in the sun. The shelves in tempered glass of the tables are cleaned in a hand with special product glazing that is found in store. I would like to make a chair but the declination is not available. What can i do ? 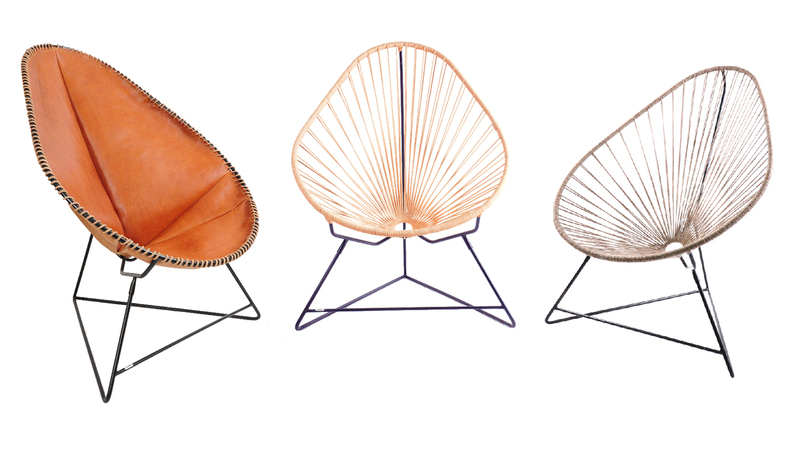 You can order a custom chair with the desired color variations. You can contact us via the contact form to confirm your request. We will be delighted to study your specific requests and create an Acapulco chair in the colors of your country, your soccer team or your "family crest." Be careful, however, according to the code of consumption, any goods made to your request excludes your right of withdrawal. How can i proceed to the payment ? To proceed to the payment, you have the choice between a credit card or a cheque. By choosing the cheque method, the preparation of the order will be longer. By purchasing with a cheque, the order will be validated once we received it. The cheque has to be sent to the following address: BOQA, 6 rue Gutenberg, ZA de la Rafette, 33450 Saint Loubès, France. Can I use the payment in several instalments ? You do not have the possibility to pay in several instalments. We can deliver all over the Europe, and to some countries outside Europe. You can check the list of countries we deliver when entering your address in your personnal account. I made a mistake on an order, how can I fix it ? You can contact us by sending an email to the following address : contact@boqa.fr ; or by phoning us to the following number +33 6 95 93 29 33. If you encounter any of these issues, please contact us so we can solve it as soon as possible. I wan't to withdraw my order after receiving it. According to the French and European Union laws, you have 14 days from the day after the delivery to make a retraction, which will consist of the return of the parcels (packaged and brand-new products) at your expenses, along with the order number. How can I leave you a feedback ? Your satisfaction is our main priority, and we give a lot of value and attention to constructive comments which can help us improving our products and services. To leave a feedback, you can contact us by clicking on the "Contact" section. Did we answer your question ? If not, you can still contact us by clicking on the "contact" section.